Italy send strong riders to Wierden. 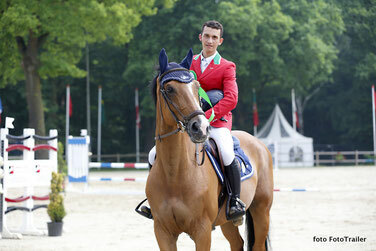 Number one and two in the Slot Ruitersport Prize, a Small Tour class for Young Riders, were the Italians Filippo Garzilli on Harmattan Del T (Robin Z) and Melanie Athina Reiter on En Rico (Escudo I). Lisa Nooren, who made her debut at the Global Champions Tour in Chantilly last weekend, achieved the 3rd prize with VDL Groep Flying Saucer (Indoctro).